Image source: Pinoy Culture. Inside a concentration camp in Batangas. A short 1901 report1 by the newly appointed American superintendent for the Division of Cavite, Tayabas (presently Quezon Province) and Batangas provides some personal insights not just on the state of education in Batangas but, more importantly, some information about Batangueño culture at the time. The superintendent’s name was M. A. Colton. The opening of these “lower education” schools, it goes without saying, had become a priority of the Americans even while the war had been ongoing. Districts of education had quickly been organized and superintendents appointed. Because of the dearth of schools at the time and the low population, it was but prudent to bundle the provinces of Batangas, Cavite and Tayabas into one district under Colton. 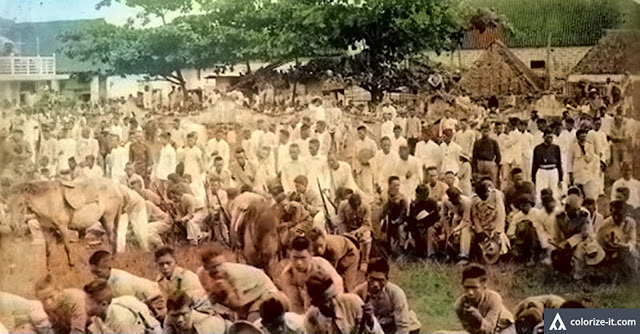 Moreover, Colton described the economic and political system still in use in Batangas as “feudal,” in reference to the medieval land distribution and re-distribution system in Europe which created a system of nobility3. The lands were then worked by peasants who were largely uneducated and under obligation to their feudal masters, the nobility. Although the Tagalog spoken in Batangas was pure, Spanish continued to be the “polite” and official language, presumably among the learned. Spanish was also more widely spoken in the province than in Cavite. This, Colton conjectured, was probably because of the “former wealth” of the principales in the former. 1 Most of the primary information contained in this article from “The Present Educational Movement in the Philippine Islands,” an excerpt from “Report of the Commissioner of Education, United States Bureau of Education,” published 1902 in Washington D.C.
2 “In our image: America's empire in the Philippines,” by Stanley Karnow, published 1989 in the United States, as quoted in Wikipedia. 3 “Medieval Life – What was the Feudal System?,” online at History on the Net. 5 This writer is unable to determine what the “petati” was; probably archaic Batangas Tagalog.